PHOTO: My group of 45 agents who got the pleasure to see the real Italy. 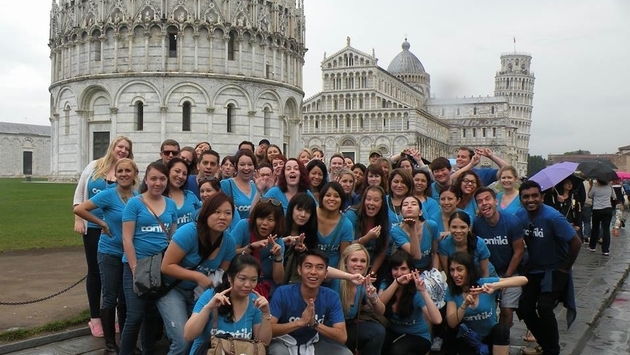 I recently got the amazing opportunity to attend a Contiki FAM trip to Italy with about 45 wonderful travel agents. The group was a mix of several nationalities, including North American, Mexican, Singaporean, South African, New Zealanders, Brits, and that’s just to name a few. The trip to Italy was the first for many of us so we were ready to explore. Every day we ended up discovering all the back alleys and sights in each city. By the end of the trip we felt like locals and never wanted to leave. This week long trip to Italy really reiterated why traveling with Contiki is the best way to see a country. Our Contiki Trip Manager Evana and Contiki Driver Rafal were our guides for the week and we couldn’t have asked for anyone better! These two had years of experience as On-Road Contiki team members and were perfect for showing us newbies around. On our first night in Rome, Raf drove us to at a local family run pizzeria for dinner and a show. While eating delicious pizza, we were serenated by beautiful traditional Italian opera! Everyone was swapping their background stories and getting to know one another. It was the perfect ice breaker for all the agents on our first night out. After Rome, we made our way to Florence where even more memories were about to happen. If you haven’t been to Florence, you need to book a plane ticket right now. It was so incredibly beautiful and well preserved, many of us joked that it looked like a movie set. To the grandeur of the Duomo or the incredibly detailed statue of David, the artwork in Florence alone had me wanting to come back. The most memorable part of my trip to Florence wasn’t the amazing artwork or even the incredible shopping but it was Pino’s Sandwiches that made me fall in love. By the suggestion of our Trip Manager, Evana, several of us walked about 15 minutes outside the city center to check out this hole in the wall sandwich shop. Needless to say, it was the best food I had on the entire trip. As we walked out of the shop I shouted, “Grazia, Pino!” and Pino responded, “Prego! Ciao bella!” and I replied, “CIAO!” It was so much fun to play a local for the afternoon and really get to see the city through the eyes of the people who live here every day. After Florence, we visited Pisa, Verona, and Venice. All of these cities left a special place in all our hearts and we can’t wait to go back. Without the help of our Contiki team members Evana and Raf, we couldn’t have learned about the cities through the local perspective or experienced all of the incredibly fun activities Contiki has to offer. Without a doubt, traveling with Contiki to Italy showed me that there’s no better way to meet others, see the sights, and experience the world of traveling! Kaitlin Krueger has been working at Contiki Vacations since February 2014 and has been in the travel industry for the last three years. Her background has always been with sales and youth travel so working at Contiki was a seamless transition! As Southwest Regional Sales Executive for Contiki, Kaitlin has spent the better part of 2014 visiting travel agencies throughout California, Arizona, and Texas holding training sessions and co-oping events at local universities. She loves spreading the #NoRegrets Philosophy to everyone she meets! Her love for travel has continued to grow as she recently visited both Greece and Italy in the last two months! She’s already visited 5 out of the 7 continents and she’s not stopping anytime soon!